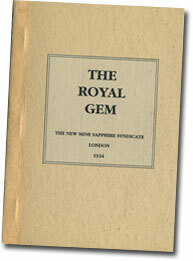 The following is a reprint of a pamphlet published in 1924 by the New Mine Sapphire Syndicate, London, describing the mining and production of what eventually would be known as Yogo Gulch sapphire. The most valuable deposit of precious stones existing in the United States of America is situated in Judith Basin county, state of Montana. The sapphire bearing claims extend in a continuous series for a distance of five miles, and with the possible exception of the South African diamond fields, form the largest deposit of gem bearing ore in the world. The discovery of this gem bearing deposit in Montana is associated with almost the same measure of romance as that of the South African diamond fields. The story of how a visitor to a lonely Dutch farmstead had his attention called to a white crystal with which his host’s small child was playing, led up to the location of the rich deposit of diamonds at Kimberley is too well known to need repetition. 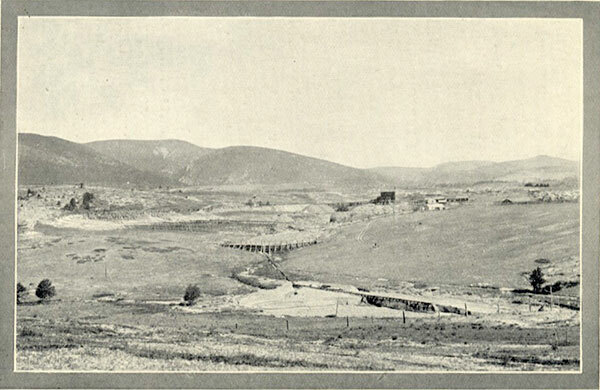 It may be claimed that the story of the disappointment experienced by four old time placer miners who formed themselves into a company for the purpose of working the gold bearing gravels found in pockets upon the limestone bench lands lying east of the Yogo fork of the Judith river, is invested with an equal spirit of romance. 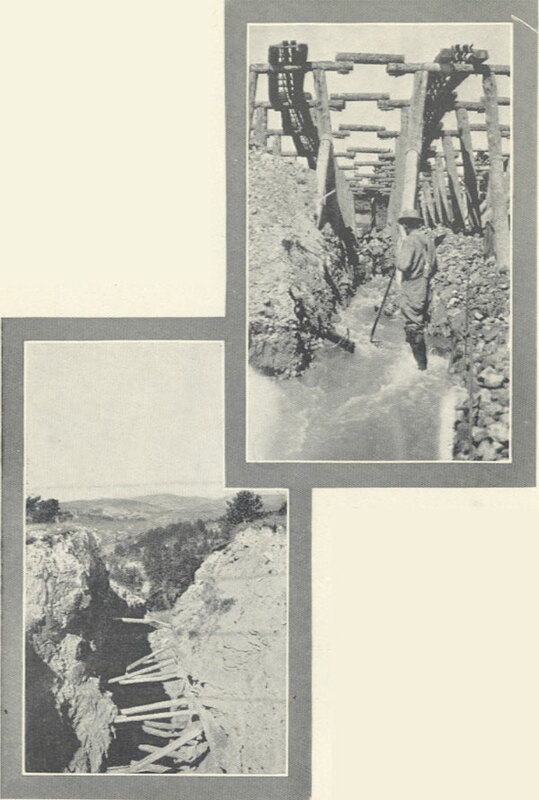 A very short trial showed conclusively that these gravels were too poor to pay for working, and that the monies, amounting to some $40,000, expended in bringing a water supply to the washings were entirely lost. 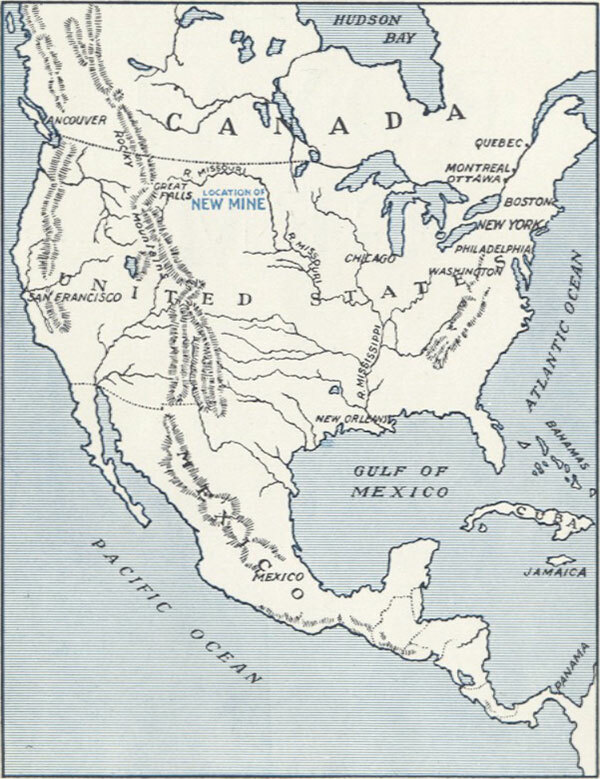 North America, showing the position of the "New Mine." View of washing floor, and flumes containing riffiles for catching up sapphires. 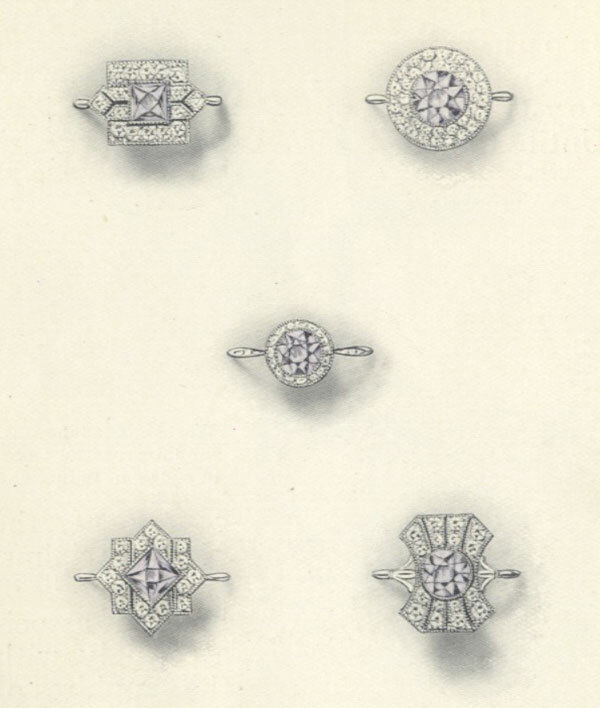 The demand for sapphires, as in the case of diamonds, is a strictly limited one, and their value is maintained by restricting output and only issuing sufficient to meet active demand, otherwise the output of Montana sapphires might be increased to an almost unlimited extent. 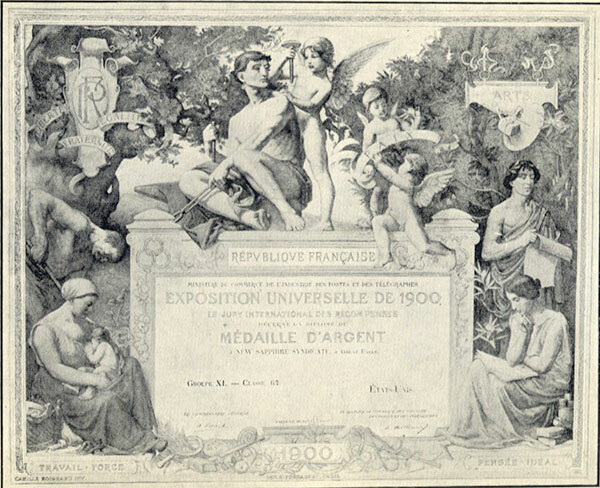 The claims are capable of great development, and as the older sources of supply become exhausted it will be possible to exploit the deposits in Montana to the extent of supplying the world’s demand for this beautiful gem for many years to come. The Montana sapphire ranges in colour from the palest shades of steel blue until it reaches, in very fine specimens, the lovely hue used in the description of sapphires as “cornflower or royal blue.” Until the discovery of the Montana claims, this shade of blue was associated only with the sapphires of Burma, Kashmir, Ceylon and Siam. 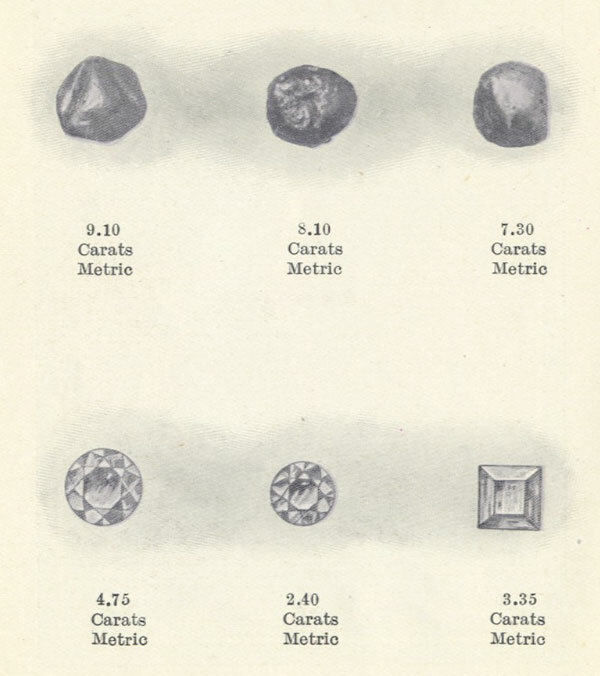 The Montana sapphire has, however, two characteristics which gems from the other sources named do not possess—the colour is always evenly distributed throughout the stone, making it bright and effective by artificial light, a charm not possessed by any other sapphire on the market. Thus, Montana sapphires match easily, and for this reason surpass in value those emanating from other countries on account of their being commercially more economical to handle from the manufacturing jeweller’s point of view. Specimens of stones in 1923. In the rough and after cutting. The smaller crystals, which through lack of colour or for want of size are unsuitable for cutting into gems, are put to many uses. They are manufactured into jewel-holes and bearings for watches, clocks, delicate machinery and scientific instruments, as well as for use in phonograph recording and reproducing sound boxes and other mechanical purposes, such as wire drawing, where an unwearable surface is required. Above, washing floor showing sapphire bearing ore in course of reduction. Below, open surface cut showing part of the original workings exploited for sapphires. The sapphires occur in a dyke of trap rock outcropping through limestone rock. The material in which they appear varies in appearance and character from hard rock down through different graduations to the soft oxidized clay into which by exposure it finally decomposes. The principal working is being conducted at a depth of 250 feet, at which level drifts have been driven east and west. The ore is broken by drilling with a low power explosive, and is raised in trucks of a capacity of 18 cubic feet each. The freshly mined ore has the appearance of a hard and fairly compact rock, slightly tinged with blue. The sapphires are distributed throughout the ore, though not in any great profusion, and lengthy weathering of the pay dirt is necessary before washing operations are undertaken, though frequent wetting of the ore by hose pipes assists in its disintegration and slackening. 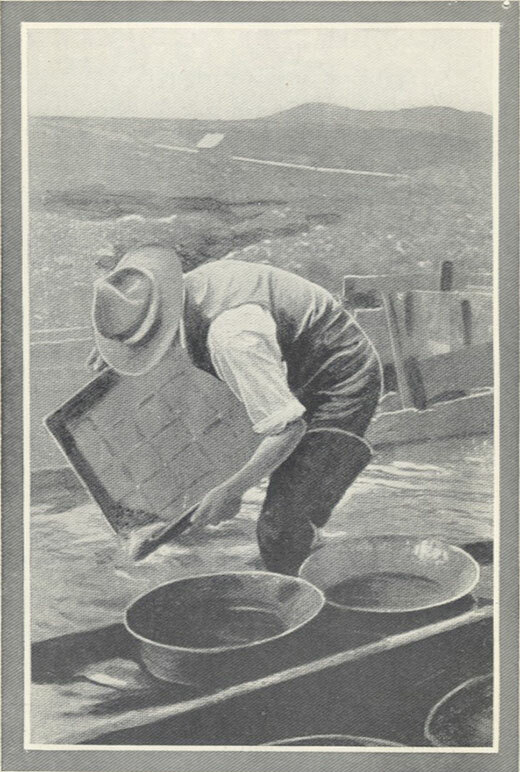 Mining is carried on throughout the year, but washing is only possible between May and November. After the ore has undergone the necessary amount of weathering, a stream of water is led against the side of the dump and the ore washed into sluices, any dirt not sufficiently decomposed to set the sapphires free being thrown back on the washing floor for a further period of weathering, while the slacked dirt is passed over a series of riffles, in which the sapphires and other minerals having a high specific gravity are retained. 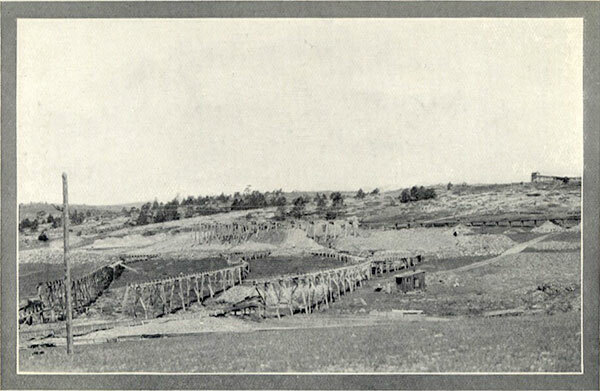 General view of Mining Camp showing dams number 1 and 2 in foreground. The coarser tailings passing over the riffles are caught up in dams for further weathering and subsequent washing. The riffles are lifted at frequent intervals and their contents passed through a series of sieves of graduated sizes, the concentrates being subjected to a series of processes for eliminating foreign material and reducing the residue as nearly as possible to pure sapphires. The remaining process is the cutting and polishing of the gems and their final manufacture into articles of jewellery. Among lovers of coloured gems the Montana sapphire takes a high place and is much appreciated, and mounted in conjunction with small diamonds, has a beautiful and pleasing effect. NOTE.—Blue Montana Sapphires may be procured through New York precious stone Importers, but should any difficulty be experienced an enquiry addressed to Messrs. Johnson, Walker & Tolhurst, Ltd., 80 Aldersgate Street. London, E.C.1., will elicit a prompt reply, furnishing all particulars desired. 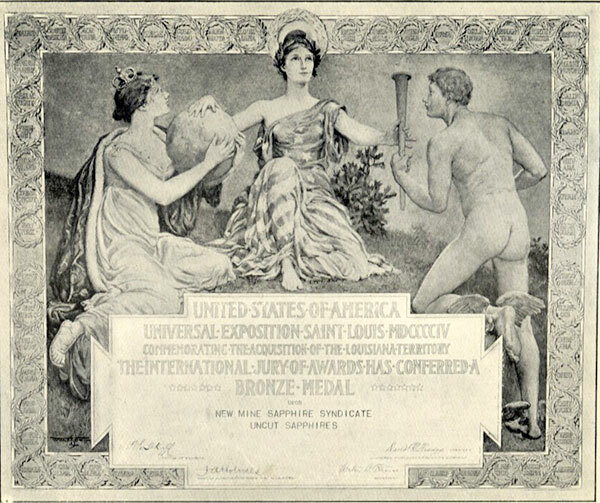 Also included in the pamphlet are the following awards issued to the New Sapphire Syndicate: Silver Medal at the French Universal Exposition of 1900, Bronze Medal at the St. Louis Universal Exposition of 1904 (uncut sapphires), Gold Medal in 1923 from the Vancouver Exhibition Association (best exhibit of sapphires).